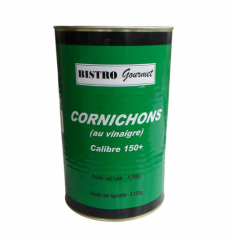 Cornichons, pasteurized fresh gherkins in vinegar. Cornichons, Water, Vinegar, Salt, Seasonings (onions, mustard seeds, coriander, black pepper). GMO free. No ionized ingredients. Those cornichons can be appreciated either as snacks, appetizers or as ingredients in various dishes such as salads. Size (in): L 18.9'' x W 6.3'' x H 9.7"